"41AN34 - 22, Burial D-3" by Timothy K. Perttula and Robert Z. Selden Jr.
DECORATION (INCLUDING MOTIF AND ELEMENTS WHEN APPARENT): the rim panel is defined by single upper and lower horizontal engraved lines. On the panel itself are a series of three sets of opposed curvilinear engraved lines. These sets are divided by sets of two closely-spaced curvilinear arcing engraved lines. Poynor Engraved, var. 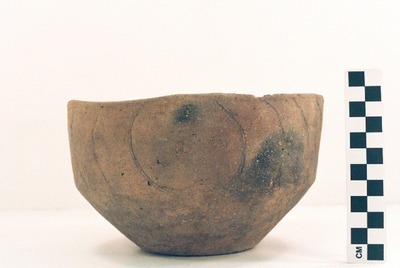 Cook carinated bowl from the Pierce Freeman site.